But I'm stuck in the mud. Ugh! I have so much to do today, but for some reason I just can't get going. I did sleep better last night so that's a big plus. But the stress of getting the house finished this weekend is getting to me and now I have to make another trip up on friday to get salvage title for one of my brothers cars he left in the back 40. I should get him to do it, but I can't count on it getting done. Along with all that, there is still the unknown if the house is really sold and will close on the first. Quite often I honestly do wonder if Mom is going to outlive me. Speaking of Mom, while she did sleep a great deal yesterday, she did eat like a horse when she was up. Last night at dinner her eyes looked brighter and she seemed a bit more in tune with the world. It makes me happy to see her more aware. More often than not, when Mom gets up for breakfast she has a real dazed and confused look about her. Sometimes that glazed-over look passes during the day, sometimes it doesn't. I did finish the ninth book of the John Carter of Mars series yesterday and started on the tenth. It won't be long now before I'm finished with all eleven. A while back I reviewed the Collar Cold Brew Coffee Starter Kit. The kit came with a twenty ounce ball jar, a lid and a straw. I drink quite a bit of green tea so an idea popped into my head. 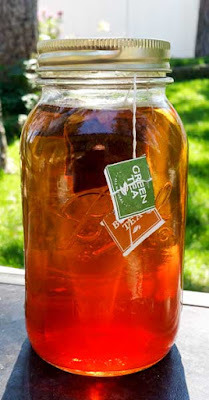 Why not use the jar for sun tea. Well I gave it a try and it worked so well that I moved up to a quart jar. Now I drink a quart of green sun tea almost every day. I know many of you probably already do something like this, but hey, I did figure it out eventually. Well my friends thanks again for reading and have a great day!